The Manage Server Connections dialog is another way to manage MySQL connections. This dialog is invoked by either clicking the manage connections icon ( ) on the home screen or by selecting Database and then Manage Connections from the main menu. It can also be invoked from any of the wizards requiring access to a live database. After the MySQL connection manager is launched, you are presented with the Connection tab of the Manage Server Connections dialog. The following figure shows the initial connection options for a standard TCP/IP connection. Connection Name: The name used to refer to this connection. 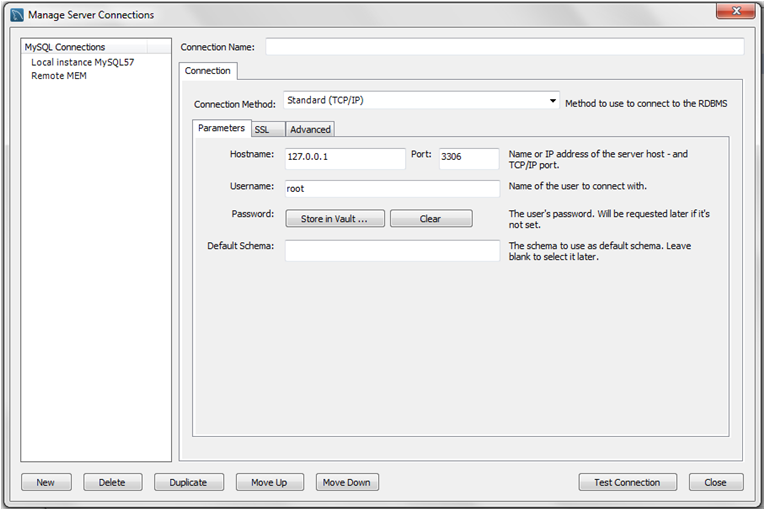 This connection can then be selected from a list in other wizards requiring a connection. Connection Method: Method used to connect to the RDBMS. After you select a connection method, the fields available in the Parameters, SSL, and Advanced tabs change accordingly. For more information about these options and parameters, see the specific section for each item. Delete, Duplicate, Move Up, and Move Down buttons: Operations used to manage the existing connections. Test Connection button: Tests the selected MySQL connection and reports the connection status. It also reports whether or not SSL is enabled. For testing remote connections, you might also use ping to check the host name, or telnet to also check the port. If these fail, then also check the firewall settings on each host, and also that MySQL server is running on the remote host. Because TLSv1.2 requires OpenSSL, support for this protocol is available for MySQL Workbench Commercial Editions, and not for the Community Edition (which is compiled using yaSSL and supports TLSv1.1 only). Simultaneous client connections: Opening a MySQL connection from the MySQL Workbench home screen opens a new connection tab in MySQL Workbench for that connection. Each of these tabs requires two MySQL connections to perform basic tasks, such schema discovery and SQL execution. Additionally, performing management related tasks, such as Server Status, requires two additional MySQL connections. Essentially, this means that each MySQL connection tab in MySQL Workbench requires four available connections to MySQL. For additional information about "Too many connection" related errors, see Too many connections. This connection requirement doubles with each connection tab opened in MySQL Workbench, even if the two connection tabs point to the same MySQL server. SQL editor tabs share their connections, so having multiple SQL editor and SQL results tabs does not affect the number of required connections. if you do not do this, workbench will overwrite all existing connection on restart if it see same id twice or more for multiple connections.